Do you dream of being like Tom Cruise in Cocktail when you host a party, but the best you can do is bust out the blender and pina colada mix? Well, I’m about to stir things up and make that dream a reality (minus the Hawaiian shirt) with our top cocktail shaker guide. Making cocktails at home is easier than you think. Forget the fancy turns, flips and spins (Tom likes to show off), all you need is the right set-up: quality liquor, ice, some fruit juices and a premium shaker that brings them all together. The right shaker can help you whip up Bloody Mary’s for brunches, kamikaze’s for Sunday football, and anything else you and your friends thirst for, quickly and easily. My guide will help you with it all, giving you a rundown of the top shakers, along with an in-depth look at the different types, uses and features. The only thing I can’t teach you are all those fancy moves..at least not yet. Stay tuned- I’m working on it. 1 Top Cocktail Shaker for Home Comparison: Which one is the Best? To get things started, let me explain what a cocktail shaker is and what it does. Cocktail shakers are 2 or 3-piece device used to mix and blend various drinks by shaking. The device consists of a long tin or metal cup with a metal top or glass to cover it; in some cases, there is a built-in strainer. You combine different ingredients, usually juice, ice and liquor in the cup, then cover and shake. Shaking allows everything to mix well, and lets the ice cool and slightly dilute the mixture, for an expertly blended drink that is smooth and refreshing. Shakers bring variety to your home bar, making the process uncomplicated and entertaining. They ensure you can give your guests whatever they want and also make sure drinks are mixed correctly. 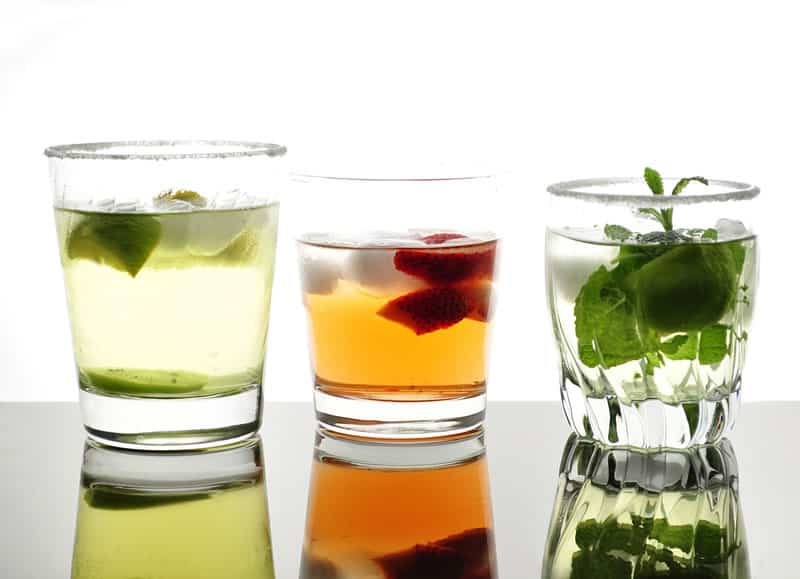 They also allow you to be daring and try new flavors or styles of drinks, expanding your palette and knowledge. Top Cocktail Shaker for Home Comparison: Which one is the Best? 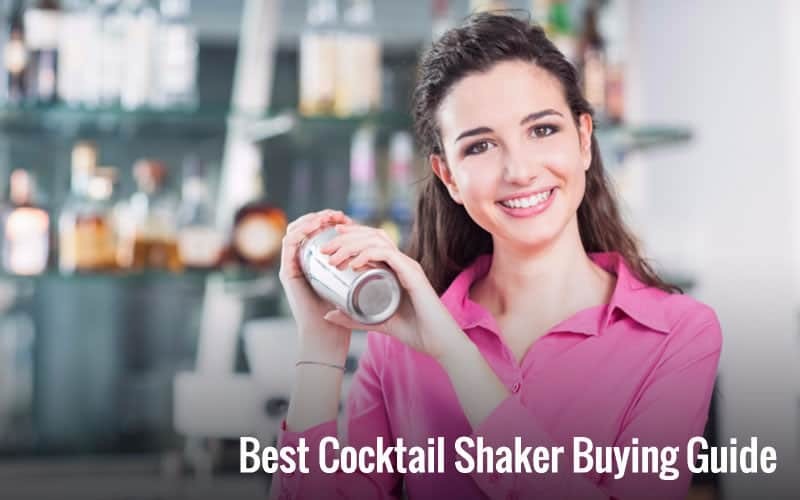 There are a lot of excellent cocktail shakers on the market at affordable prices, so it really comes down to what works best for you. Each of these top picks have different features to offer, so there is something here for everyone. This Cobbler style shaker set is the perfect companion to any home bartender, taking them from beginner to pro in no time. 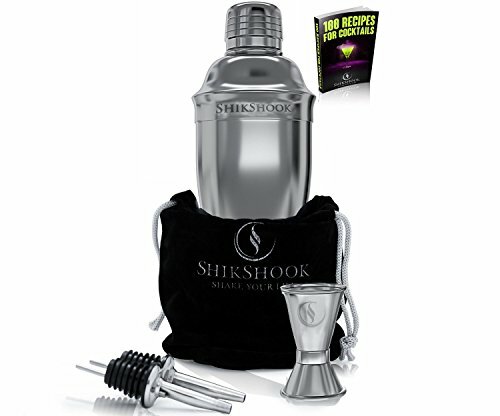 Priced at just $18, the set has a tin shaker and built-in strainer, along with 2 pour spouts, 2 jiggers and a cocktail book to help you truly entertain your guests and teach you the ropes. The entire set is made of stainless steel, so it won’t rust or break, for easy care and maintenance. The main tin is 24-ounces, so you can concoct multiple drinks at once, and the recipe book lets you come up with unique and refreshing drinks. The 2 jiggers allow you to perfectly measure liquor before adding it to the tin, which is a big help when making complicated and layered drinks. Meanwhile, the 2 pourers let you pour shots and more like a pro-Tom Cruise move over! Finally, the strainer is built into the cap, so you can shake and pour martini’s and look good while doing it. A good teaching shaker if you want to regale your guests and elevate your cocktail style. This set is easily the best value for your money, with a price tag just under $15. Consisting of 3-pieces and a free jigger for precise pouring, this set is low in price but high in quality. Designed with high-grade stainless steel, it won’t rust or leak for a mess-free experience. Plus, the high-grade steel means no metal taste when mixing, for fresh, appetizing drinks every time. The tin is 24-ounces, so you can mix for you and your closest friends without hassle and there is an eBook included that has over 50 drink recipes. Dishwasher safe and free of any chemicals, this is a smart investment that gives you your money’s worth. For those who already know the basics, or like to host large parties, this set is a bargain under $20. 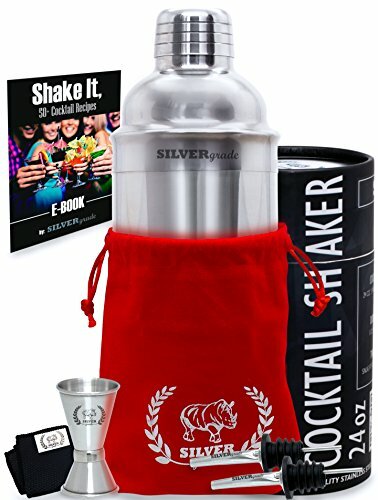 With a shaker, jigger, cocktail book, mocktail book and eBooks, you can make sure very guest is happy and refreshed. The shaker is 24-ounces, so it can hold 3 drinks at once and is protected against rust, leaks and erosion. Comes with a 5-year warranty and is a great for social butterflies who love to entertain. You get a complete bar-on-the go, as this set has a 3-piece Cobbler shaker, double jigger, 2 pourers and recipe book that fits neatly in a luxurious bag. So you can mix drinks at home or shake up some cocktails for friends on the beach. The 2 pourers give you control when pouring measurements or shots and the double jigger takes the guesswork out of how much you poured. And the book of 100 recipes means you can try a new drink at every party. Looking for style and function? 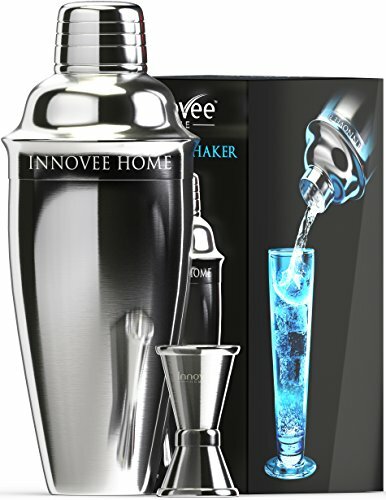 If so, then check out this eye-catching shaker set from Inovee. Designed to impress with a shiny stainless-steel finish, you’ll be even more impressed by the $15 price tag and how well-made it is made. This 24-ounce shaker looks polished and professional, and would impress a professional thanks to the fine strainer and solid fit between the shaker and the top. You can flip and shake without it opening or spilling, so you can dazzle not just with the taste of your drinks, but with your moves as well. Plus, the free jigger is great to serve shots or calculate servings. Dishwasher safe, you will never see any tarnish or erosion, looking just as shiny as the day you bought it. With a recipe book to help you create original and classic drinks, this is a set that works in any home. While all cocktail shakers have the same basic style and purpose, there are some differences in terms of materials used and how the pieces fit together. To help you figure out what type suits you best, here is an overview of the different types, along with the pros and cons of each. These are the most commonly used shakers, and a favorite among bartenders, consisting of a tin and glass cup. You can add ingredients to the glass, to see how much you are using of each, then place the tin on top, which lays neatly inside the glass. Flip it over, shake, and voila: you have the perfect drink. This style has a lot of great advantages, as they are both inexpensive and easy to clean. However, it takes a little practice to fit the parts together, there is no strainer and the glass can break, so beginners will want to go slowly. The Cobbler is sleek and easy to use, with a tin shaker, cap and built-in strainer for 1-2-3 mixing of just about any ingredient. Available in stores everywhere, it is quite convenient thanks to the all-in-one design and various sizes available. You can get a single-drink size shaker for more intimate gatherings or a larger one that mixes 10-15 drinks at a time, saving you time when you have big parties. Plus, you can add ice, ingredients, shake and pour: no other tools needed. On the downside, the built-in strainer means you need to clean between drinks if you are making different cocktails and the metal on metal can make it hard to open at times. Also, the holes to pour are smaller than average, which can slow down serving times. Best used for smaller parties. The French or Parisian style shaker looks similar to the Boston style, only it is sleeker and more polished thanks to the tin upper part in place of glass. Considered to be the original and a classic among bartenders, it is easily the most stylish and looks great on top of any bar. This design has no strainer but is easier to open than the Boston, so mixing is quick and hassle-free. The only negative is that it is hard to find, so you’ll most likely need to buy one online. This cocktail is classic and timeless, making it a favorite and must-know recipe for any bartender. Shake vodka, triple sec, cranberry juice and lime juice over ice in a cocktail shaker with strainer. Pour into a large cocktail glass and garnish with a lime if desired. This is a slight variation of the original recipe, eliminating difficult-to-find ingredients without sacrificing taste. Fill a cocktail shaker 1/3 of the way with ice, then add all the ingredients and shake well. Strain into an old fashioned filled with ice and garnish with mint springs and lime wedge if desired. There are many versions of this party favorite, so here is a basic one you can serve as is or add to to make it your own. Rim the edge of a margarita glass with salt. Fill cocktail shaker 2/3 with ice, then add all the liquid ingredients and shake 10-15 seconds. Place ice in a margarita glass and strain contents of shaker into the glass over the ice. Garnish with a lime wedge if desired. To upgrade to a more sophisticated margarita, use a premium tequila like Patron Silver or replace triple sec with Grand Marnier. To get the most out of your cocktail shaker and help it last longer I have some great tips on how to clean and care for yours. Since you are working with metal and glass components you may need to wash them separately or use different cleaning products. Any glass components, like the cup of a Boston shaker, are dishwasher safe and can be cleaned with your other dishes. If you are throwing a party, try to rinse it with water between drinks so the sediment from any fruits or juices your using to form a film. Do not rinse between drinks with soap, as it may leave an aftertaste. Wash all tin and steel components by hand using soap and water. Dishwashers can cause them to become dented or compromise the metal’s integrity so they are no good. Also, dry them thoroughly so they look sleek and shiny. Mesh strainers are best cleaned in a dishwasher; sponges can get caught on the mesh if you wash them by hand or the pressure from scrubbing can bend and damage them, so the dishwasher is a safer bet. And since the mesh is so thin, the washer will ensure every crevice is cleaned. Traditional strainers are better off being washed by hand. Although they are quite durable, the larger hatching makes them a candidate for a thorough hand-scrubbing. Be sure to dry them, so no bacteria is left behind. Now that you armed with all you need to know about cocktail shakers, it’s time to buy one and get rid of that blender for good. 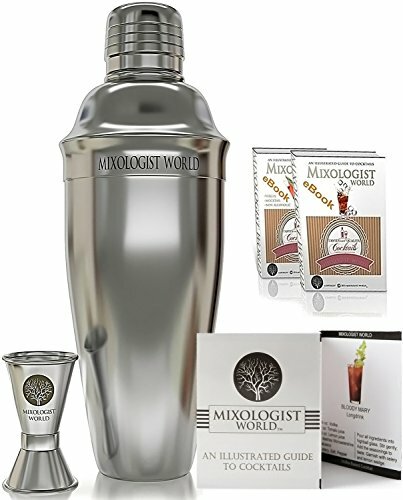 My top cocktail shaker guide proves that anytime can be a great home bartender with the right tool- and a quality cocktail shaker is just that tool. 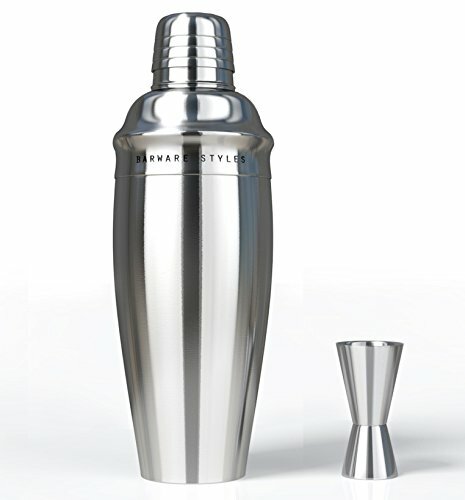 We highly recommend SILVERgrade Cocktail Shaker Set.